Tennis tournament, a photo by The Bacher Family on Flickr. 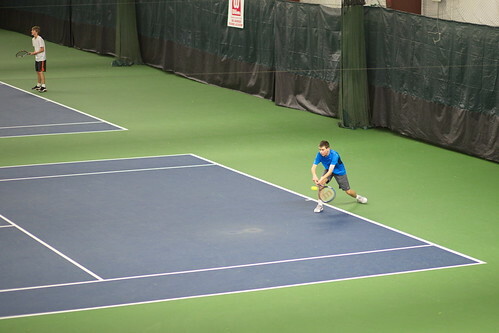 David had an opportunity to participate in a public tennis tournament at Sprinker Recreation Center in early December, and he did pretty well, winning his first match decisively and competing well in his second and third despite being up against more experienced opponents. It's hard to get good photos at the Sprinker Center, because the only viewing area is at one end of a vast room; my best action shots were when David played on the second court, close enough that I could use my 85mm prime lens with a wide aperture and sharp focus.